Lamy is probably best known for their no-frills, inexpensive Safari line of pens. But when Safari owners want to step up to the next level, the Studio is usually their top choice. The Lamy studio shows with great elegance just how close design and art can become. Take its clip, for instance: a completely new interpretation of the theme, an exceptionally appealing clip reminiscent of modern sculpture. The finishes vary from brushed stainless steel to matte palladium plating. The packaging is a basic Lamy plastic and cardboard box, nothing really to crow about. Each pen is sold with one blue ink cartridge and an ink converter, as shown below. Not only does the minimalist design accentuate the futuristic, ultra-modern appeal to the Studio, the texture of the barrel and cap material complement the experience. Brushed stainless steel has been done before: Sheaffer, Parker and Waterman all have a "stainless steel" finish pen in their collections and it is my opinion that Lamy does it the best. The texture is not only very tactile, it provides a degree of luminosity that intriguing and beautiful. The Lamy Studio nib is stainless steel. In the Palladium (and other limited edition finishes) a 14ct gold nib is used. The stainless steel nib is more than sufficient. As many Lamy Safari owners know, the inexpensive steel is a smooth writer. The Studio nib is similar in nib flow, line quality (thickness) and point durability, which is a definite positive. The nib sizes range from broad to extra-fine with a general tendency to be a bit thicker than the size indicates. Writing with a Lamy Studio is definitely an easy, painless experience. The cap snaps on and off the business end while securely posting to the back of the pen with a satisfying click. 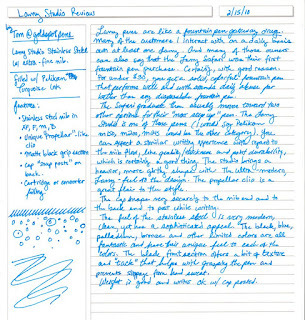 The weight of the pen (even with cap posted) is heavy enough to let you know that you are writing with a solid pen without tiring your hand out over long writing sessions. The black front grip section has a bit of a matte feel. It offers enough "tack"-iness to aid with your grip and prevent sweat from making your fingers slide from their position. If you want a pen that will be your daily workhorse and diligent note-taker, the Studio is the way to go. This is a great gift idea for students in college or if you're looking for a pen that is a step up from the Lamy Safari that you love and cherish.